Low mechanical and chemical load rating, medium retraction force. The optimal solution in most areas of application. Chemically, mechanically, thermally and optically (different colors) excellent. Very good retraction force. The use of spiral cables will be necessary in almost all market segments. Whether communication (telephone, radio) or medical technology, motor vehicle industry, mechanical engineering etc. or as feeder in lamp industry, spiral cables are used everywhere. 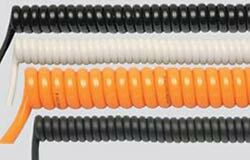 Apart from the electric-mechanical advantage, spiral cables are often an excellent optic structural solution. If you use PCV or PUR cables, the color of the feeder may mostly be brought into line with the object. Even copper shielded cables are available.